In the first century A.D. the Romans built Arrabona on the site of a Neolithic settlement, and a Celtic merchant town. Visigoths, Huns, Avars, Franks, and Moravians occupied the site over the centuries. 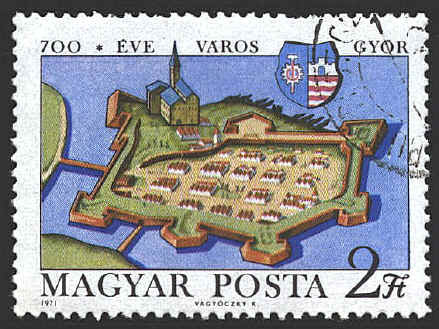 Towards the end of the ninth century the Magyars drove out the Moravians. In 1001 King Stephen made Györ an episcopal See and a county seat. The Tartars burned it in 1241, and the Hungarians then fortified the site with the strongest defenses yet raised there. The Turks invaded in 1526 but Györ did not fall. Later, under the rule of Emperor Ferdinand of Austria, the Turks took the fortress. After the Turks withdrew the fortress was rebuilt in accordance with the most advanced techniques of military engineering. The new fortress was designed by Pietro Ferabosco. Construction began in about 1554. The plan on the stamp is a small part of Nicolo Aginelli’s Javerinum olim anno MDLXVI... accuratissime delineatum, redrawn by Gerog Hoefnagel for Georg Braun’s Urbium praecipuarum mundi theatrum, 1597. The position of the wall is believed to lie on the perimeter of the Roman military camp. The bishop’s palace, the Püspökvár, built in the 13th century was built into the walls. The fortress withstood the Turks in 1594, though it was entered by treachery. The Hungarians regained it four years later, and it was never captured by the Turks again.